Caesarean section births, also known as c-sections, are used to surgically remove a baby from a mother’s uterus, bypassing the birth canal. There are a number of reasons why an obstetrician may order a c-section birth, either for concern of the mother or baby’s health, or complications of vaginal delivery. Some of the most common reasons for c-section births include breech presentation, a multiple birth, difficulty during labor and complications of the placenta. 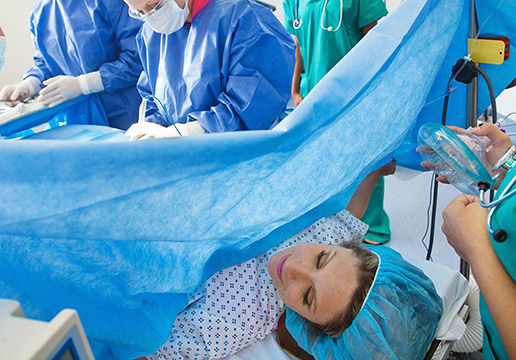 A mother may or may not be awake during a caesarean birth, depending on the nature of pain management used during the procedure. Either a transverse or vertical incision will be made into the uterine wall, out of which the obstetrician will deliver the baby and placenta. The incision is then repaired, and a hospital day of approximately three days will follow. Women who undergo caesarean section births may be at risk for complications of the procedure, such as infection of the surgical site and blood clots. Obstetrical care will continue in the weeks following a c-section to monitor recovery and manage any complications that may arise from the procedure.